Risk is a question of perspective. 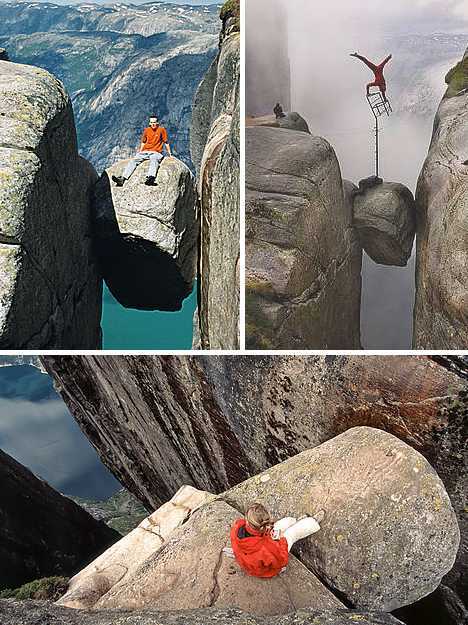 One person can look at these pictures and feel very uncomfortable because he feels its risky. While another will take precautions and jump onto these balancing rocks without any measure of risk. The common view that entrepreneurship is risky is incorrect. It is really a myth and not factual. It is a matter of perception. Your perception can become your reality. There are risks associated with starting new ventures just like there are risk for not doing anything. In life there is rarely anything that is risk free. If you are sitting in your house there is a risk that a plane may fall upon your house and kill you. However in normal circumstances this risk is low. Similarly in entrepreneurship there is risk but it can be managed so that entrepreneurial risks are moderate and not high. Many people confuse entrepreneurship and speculative gambling with capital in the hopes of making it big in business. Entrepreneurs take calculated risks. Entrepreneurship is really not risky but there are risky entrepreneurs and entrepreneurs who simply take calculated risks. Whether you pursue a business opportunity or not, you are taking a risk. I know Zimbabwean people who were so scared of risk that instead of investing they kept their money in the bank until it was wiped out by hyperinflation in 2007-8. So although they thought they were conservative it turned out that the risk of not investing cost them opportunities of a life time and left them poor and destitute. Those who during those times invested in hard assets appeared risky but turned out to be more prudent when the hyperinflation wiped away all bank savings. Like someone correctly put it, “Opportunities of a lifetime should be seized during the lifetime of the opportunity.” The “window of opportunity” will open, and remain open just long enough. We cannot be the only entrepreneurs that perceive these opportunities. How long will it be before the need becomes compelling enough for others to jump in? How long before the opportunity passes because the window of opportunity has closed? Uncertainty of income – if possible do not start without at least six-twelve months working capital to cover both the business and your living expenses. Or alternatively start the business while still gainfully employed. Do not hastily quit your current source of income. Risk of losing entire invested capital- Do not invest all your resources but rather invest an amount you can afford to lose. Be prudent in your cashflow projections and rigorous in assessing and evaluating your business idea. Not every business idea is a viable business opportunity. Do your homework thoroughly before you risk your capital. Lower quality of life until business gets established. This is managed by easing your way into the business unless you have been forced into it by a retrenchment or some other unforeseen external event. So will you continue to sit and watch the clouds or will you seize the moment and plant your seed capital into your dream? Cloud watchers rarely achieve anything meaningful. The Bible says that those who watch the clouds will not sow!